In full disclosure, I’m personally acquainted with the owners and employees of the Lotus Pepper food truck. That means my review may be a little biased, but generally, I tried my best to be objective. 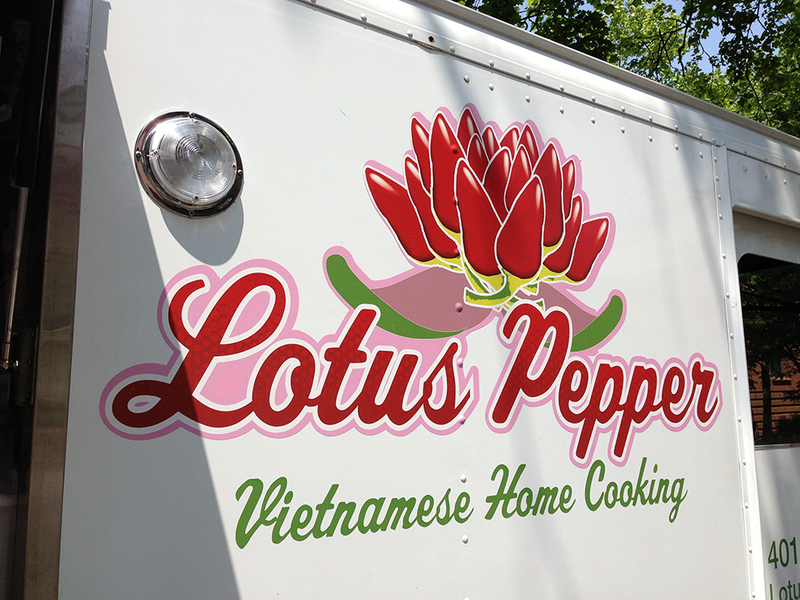 It didn’t hurt their cause though that I happen to love Vietnamese food, which Lotus Pepper specializes in serving! What makes Vietnamese food different from other Asian cuisines? I’d be lying if I said I knew the details exactly, but what I can tell you is that it’s a harmonic balance of fresh, fried, and grilled cuisine, but with a strong focus on fresh herbs. The vegetables/herbs are often raw and crisp, while the fried elements are full of flavor, but without that sink-to-the-pit-of-your-stomach effect that a lot of fried food has. In addition, Vietnamese food sports a variety of fresh herb, pickle, and meat-filled sandwiches usually encased by wonderfully light french baguettes. The most famous Vietnamese dish in America is probably Pho – a deliciously hearty soup that incorporates meat with noodles and which introduced me to my first indulgence in Vietnamese flavors. Of course, you’ll find the usual staples as well, like mixed fish sauces (with chili pepper! ), tofu, simultaneously sweet yet savory meats, and spring rolls, but it’s the preparation that gives these “common Asian-dishes” a uniquely Vietnamese twist. For example, Vietnamese fried spring rolls don’t taste like any Chinese spring roll I’ve ever had (probably due to the often minced filling) and Vietnamese fresh spring rolls (Gỏi cuốn / nem cuốn) are truly reminiscent of their namesake because of the light, subtle flavors. This is by no means a fully inclusive description of such a rich and variable cuisine, but it’s a start! Many of us imagine fast food delivery or dining in a fine restaurant when it comes to Asian cuisine, but with the food truck craze in full swing, Asian home cooking is hitting the streets as well. 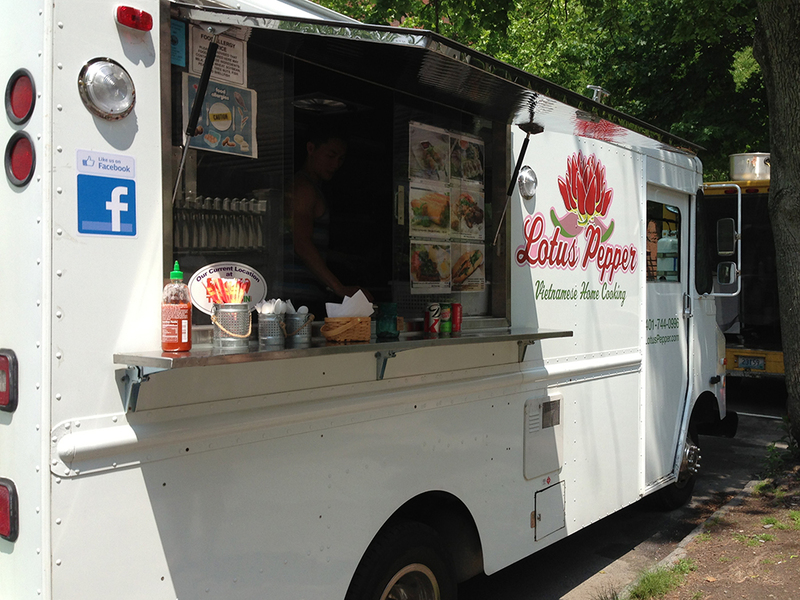 Lotus Pepper is one of the many food trucks in the Providence food scene, but one of the few to spotlight Asian cuisine. The interesting thing about food trucks is that their atmosphere is really dependent on where they are parked and what the weather is like. On this particular day that I visited Lotus Pepper, the sun was shining and the street wasn’t overcrowded. 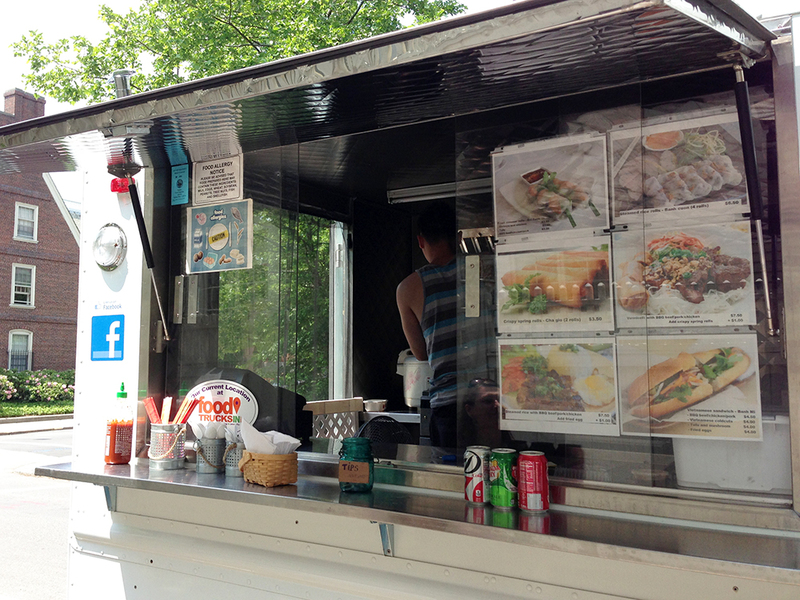 Food trucks like Lotus Pepper have the benefit of moving around when an area is no longer optimal, but that also means that they don’t have any committed seating area. In my case, I ordered my food and found a nice shaded spot to sit on a low, sidewalk-facing wall outside of Brown University on Thayer Street. The real clincher for a food truck is how accessible the employees are. One of the employees (who I do know outside of the context of the food truck) made me feel very welcome as I approached the truck. He greeted me in a friendly manner, talked about the day, noted that business was going well, and then took my order after telling me about the specials that day. Food trucks can sometimes run out of food items and this particular employee made sure that I knew what was available since the truck was about to close after a lunch service. Now, you might think that my experience isn’t necessarily common because I knew this employee, but after I ordered, I witnessed him give a complete stranger the same treatment and offer alternative choices when the man stubbornly stated, “I hate pork.” I personally thought that he was at the wrong truck if that was the case, but the employee working the window proved me wrong as he gave the man a rundown of non-pork options that delighted the anti-pork inclinations of this first time patron. As my first time at the truck, I wanted to try a few items to share with my girlfriend who was with me and I wanted to make sure that those items were as portable as they were delicious. I settled on ordering one order of fried spring rolls, an order of fresh spring rolls, a Banh Mi Cold Cut sandwich, and a Banh Mi BBQ Pork sandwich. 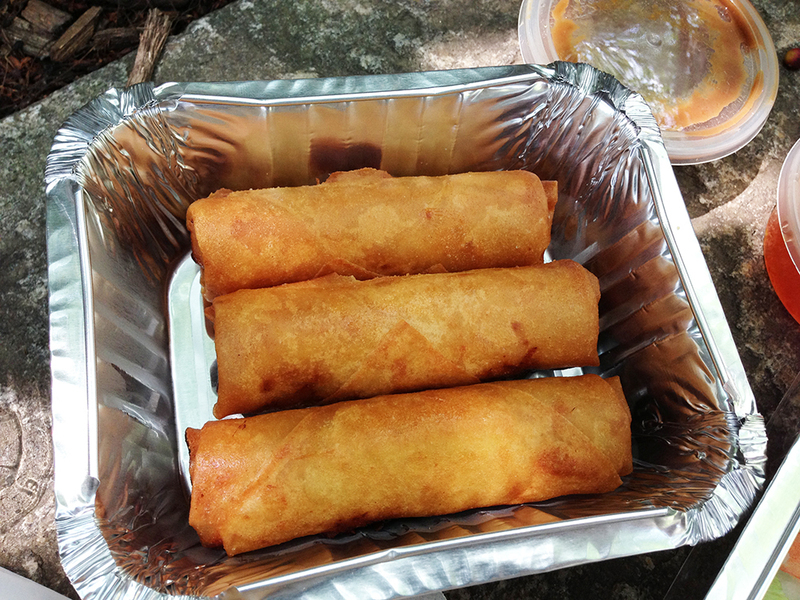 Fried Spring Rolls – The fried spring rolls came in a disposable tin of three along with homemade fish sauce. The fried spring rolls were, as expected, delicious and crispy. The finely minced filling played a double role by blending the flavors of the ingredients perfectly, while also providing a delicious grainy-paste-like texture unlike any other non-Vietnamese fried spring roll I’ve ever tried. While wonderful on their own, the spring rolls really shine when dipped into the homemade fish sauce. People that might not know what fish sauce is, should understand that the smell can be off-putting to those not used to it. Nonetheless, the taste of the sauce is an impressive balance of salty, sweet, sour, and spicy. The other point to note is that mixing a good fish sauce is kind of an art form. We take it for granted when get it at a restaurant, but I dare anyone to try and mix a batch at home without the proper recipe. It’s… shockingly difficult. Fresh Spring Rolls – Aside from having a similar shape, the fresh spring rolls are as different from the fried spring rolls as a Garden salad is from a Taco salad. 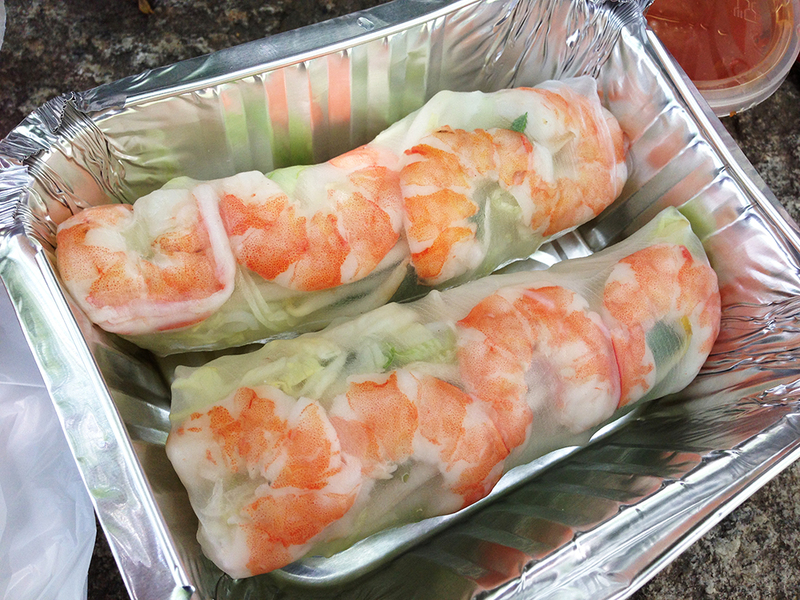 The somewhat gelatinous rice paper wrappers envelop steamed rice vermicelli, raw bean sprouts, scallions, and lightly steamed shrimp. It’s important to note the sheer quantity of the shrimp in Lotus Pepper’s fresh spring rolls because I’ve never had this much shrimp in one roll, so this was a welcome surprise. All of the ingredients are so clean and light that if there is a better example of figuratively eating the spring season, I don’t know what it is. These spring rolls are served along with a rich, thick, sweet, peanut-based brown sauce. That sauce is very tasty, but you’ll find me dipping the fresh spring rolls into the fish sauce as well because it adds a little spiciness and keeps that lightness of the rolls intact. If I had one note to give Lotus Pepper on the fresh spring rolls, it would be to maybe add a little fresh mint, cilantro, or both to the rolls for just a little extra complexity. Otherwise, these rolls are tasty, refreshing, and filling. BBQ Pork Banh Mi – On to the main event – The sandwiches! At the recommendation of the employee working that day, we purchased a BBQ pork sandwich, which I’d never had before. He called the cold cut Banh Mi sandwich, “traditional,” and I’m nothing if not traditional, so I went with that sandwich myself. The BBQ pork sandwich my girlfriend ordered was excellent. The french baguette was crispy, flaky, and not heavy like the french breads often found at grocery stores (after some research, the secret seems to be incorporating rice flour into the bread). The fresh vegetables and herbs in the sandwich also went a long way towards making the rich pork feel lighter. The pork itself was savory and sweet with a slight sesame flavor, but not slimy or wet due to a sauce. Instead the flavors were cooked right into the meat. After tasting this sandwich, I was shocked that I’d never had one before because now I can’t imagine not getting one every once in a while when I want to mix it up a bit. Cold Cut Banh Mi – Similar to the BBQ Pork, the cold cut Banh Mi sandwich has fresh pickled carrots, pickled radish, a sliver of cucumber or two, and fresh cilantro. It also has a mayo spread, a liver pate, and two or three kinds of pork cold cuts with different textures that I couldn’t identify even if you put a gun to my head. My girlfriend doesn’t like fatty cuts of meat and one of the cold cuts in particular is very fatty/gelatinous, so this sandwich was not for her. Me, on the other hand, I have no problem enjoying this type of sandwich and I have fond memories of trekking through Chinatown in Boston on the hunt for the perfect Banh Mi Cold Cut sandwiches. I thought the sandwich tasted great with all of the right flavors in all of the right places. 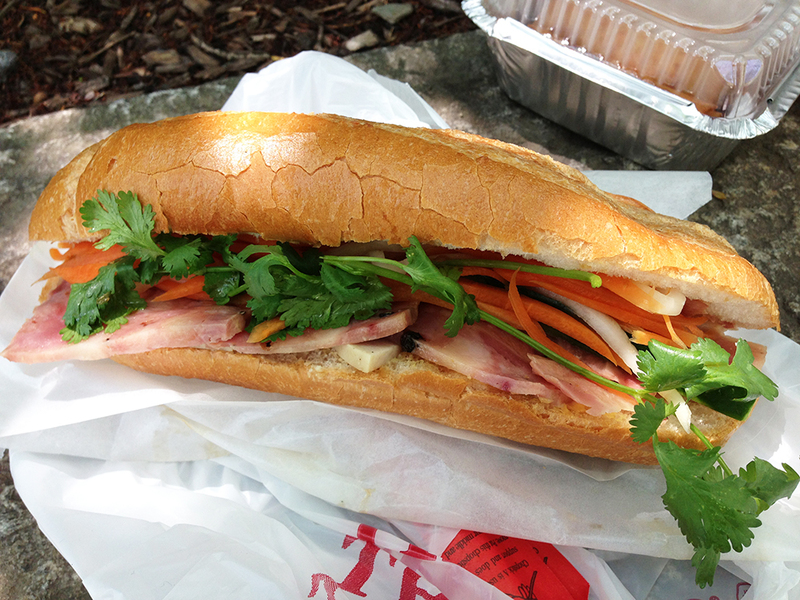 If someone knows of a better Banh Mi Cold Cut sandwich in Providence, RI, I’d like to know where it is. After reading the mostly positive reviews of Lotus Pepper online, there were a couple of people that complained that the sandwiches were skimpy. I’m not sure what they were expecting because Banh Mi sandwiches aren’t burgers or Italian grinders. They’re meant to be filling, but light with refreshing flavors all at the same time. Nonetheless, my girlfriend and I couldn’t finish our sandwiches or even all of the spring rolls. We each ate half and saved the rest for later because it was such a satisfying meal. There are a few Vietnamese restaurants in Providence, RI, but unfortunately, very few good ones. Lotus Pepper is one of the best in my opinion. Their menu changes (often daily) because the food is made fresh daily. The quality of the food is good and feels like eating home cooking at my friend, AmasianV’s, mother’s house. If you’re looking for fast, affordable, easy, refreshing, and filling Vietnamese cuisine, then give Lotus Pepper a try. One amazing Monster Truck back-flip. Maybe I should get my moms to start a food truck too! Um… obviously. Food truck wars commence! Oh man … that all looks amazing. Tell your friends to field trip their truck to Boston one day. I’d happily stop by with an army of hungry friends. I’ll see what I can do and let you know! What a great review! Those spring rolls are simply beautiful!!! WANT.